La Concorde, later Queen Anne’s Revenge was what is known as a square-rigged vessel, meaning the primary sails used to propel the vessel were set perpendicular to the keel of the vessel. A vessel with this type of rig would place many unique demands on the crew, both on deck and above, including furling (rolling up) sails at great heights in the air and hauling on lines with incredible force on deck. These and other jobs would have been the primary responsibility of most of the sailors on board Queen Anne’s Revenge, as the sails carried by the vessel were, in many ways, the most important part of the ship. 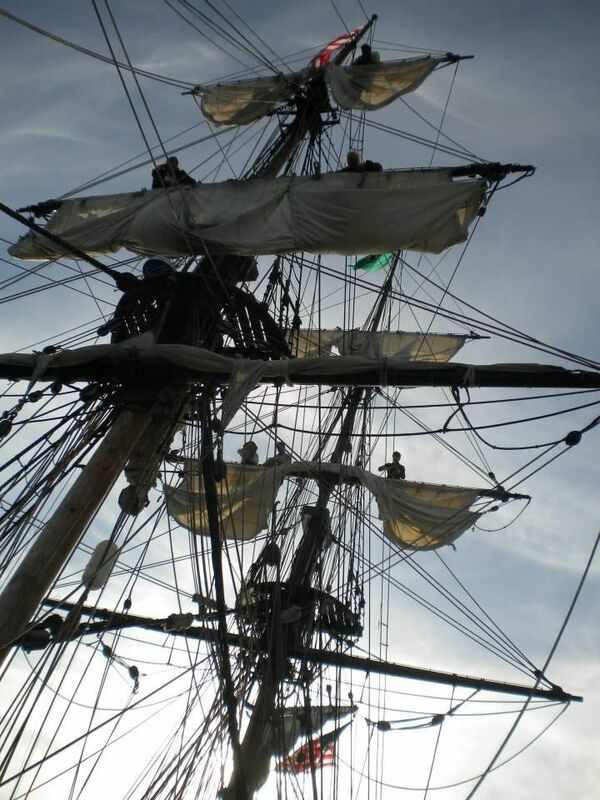 The sails were attached, or “bent,” to long horizontal spars of wood called “yards” suspended above the deck through a complex system of ropes. The first task demanded of sailors before setting sail involved climbing aloft, sometimes more than one hundred feet in the air, to untie the short pieces of rope called “gaskets” that kept the sails furled against the yards. Once back on deck, setting a square sail involved two basic steps: 1) the lower corners of the sail in question had to be pulled down, known as “sheeting home,” or for the lowermost sails one corner was pulled forward, while 2) upper sails and their respective yards needed to be hauled up the mast, which is the origin of the term “halyard,” the ropes used to perform this task. Both sheeting home and hauling a halyard were intensely physically demanding and required multiple sailors hauling on the same line. Even using a system with multiple points of mechanical advantage to overcome static friction while initially hauling a halyard could sometimes require hundreds of pounds of force. Queen Anne’s Revenge could have carried as many as ten sails, but it would have been rare that all the sails were set at once. Each sail performed differently, and different combinations of sails would have been used to suit different weather conditions. A ship like Queen Anne’s Revenge was not the most efficient when sailing directly downwind, but sailed best with the wind “on the quarter,” or from behind at an oblique angle. The yards would be adjusted through lines called “braces” to utilize the most sail area. A square-rigged vessel could only sail approximately sixty degrees into the wind, and so often used a shallow zig-zag pattern to reach their destination. Sailors on deck were responsible for monitoring weather conditions, adjusting the sails according to the commands of the sailmaster, and doing repairs and preventative maintenance, constantly ensuring that the sails were performing in the most efficient manner. These responsibilities never let up throughout a voyage, and were often physically demanding, but to neglect them meant to neglect the vessel, which was the most important part of a sailor’s life, and was the difference between reaching port safely and maritime disaster. -Harland, John H., and Mark Myers. Seamanship in the Age of Sail: An Account of the Shiphandling of the Sailing Man-of-War, 1600-1860. Annapolis, MD: Naval Institute Press, 1985.